Normally the pool of death, Pool D has to step aside for Pool B to claim that title this season. Still, Pool D still boasts plenty of drama and uncertainty. It’s hard to feel totally confident in any of these teams, but the potential for one of them to catch fire is certainly there. It’s hard to get a read on Raleigh Ring of Fire this season because their performances have offered enough evidence to contradict any narrative you try to throw at them. They came into the season as seemingly the only credible challenger to Revolver but dropped their one game against the defending champs at US Open. At Worlds and Pro Champs, they didn’t even get far enough to have a shot. Does this make their season so far a bust? To be sure, failing to make the semifinals at both the World Championships and Pro Champs isn’t a good sign for a team with their eyes on a title. But–and whichever way you slice it, there is always a ‘but’ with this team–their resume still easily qualifies them as a top seed. They’re undefeated against teams not named Revolver, PoNY, and Dig, and they lost their three Revolver/PoNY games by a grand total of five points. The tape tells a similarly contradictory tale. 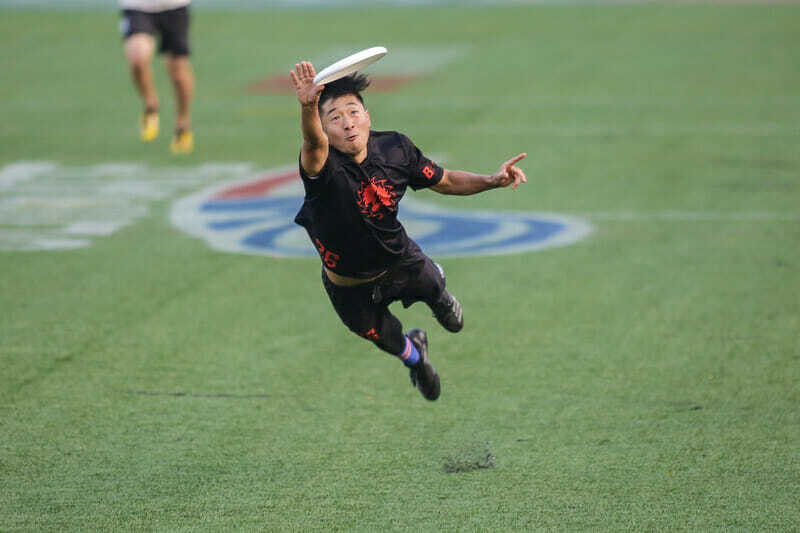 The offense has been sparkling–in particular, the first half of their US Open semifinal against PoNY was an absolute clinic–but has been prone to some boneheaded mistakes. The defense has had trouble in big games at Worlds, the US Open, and Pro Champs, but those games were against Colony and PoNY, which is to say that their defense had trouble stopping Jimmy Mickle, which is true of pretty much every defense since about 2013. The Ring roster has as much talent this season as it’s ever had. In fact, there is so much firepower coming out of Raleigh that one of the team’s problems this season has been figuring out how to get it all on the field at the same time. Show me the defense that has the horses to run with Jack Williams and Goose Helton and Henry Fisher and Matt Gouchoe-Hanas and Jacob Fairfax and Dillon Lanier and…well, you get the picture. But, and this may be the biggest but of them all, for years, Ring has never been a team that capitalized on talent. It was a team that frustrated the talent of others. They’ve had to switch their team identity on the fly, and that vacillation may be what has made them so hard to pin down all year. They contradict any narrative we try to saddle them with because they are in a state of transition that defies easy labels. The good news is that Nationals turns narrative into reality, and we’ll get to either label them as champions or something else. Furious George came out of nowhere to win Northwest Regionals, their first regional title since 2006. In a bid rich Northwest, it wasn’t a surprise that they qualified, but the manner in which they did so turned some heads and catapulted them up to the 5th overall seed. Of course, recent history can show us that having a big Northwest Regionals can be a bit of a poisoned chalice. In 2015, Rhino pulled off a big upset over Sockeye to win the region, only to finish last in their pool and then ignominiously get shellacked by the same Sockeye in prequarters to end their season. So what does fate hold for Furious? Did they peak at Regionals, now overseeded and ready for a fall? Or is the team really as good as their position would suggest? On paper, it seems like Furious could be in for a tough weekend. The resume is suspect, with no wins against Nationals teams outside of their region. In fact, they have not even played a Nationals team from outside the Northwest. They are 2-4 on the year against Rhino and Sockeye, grinding out their algorithm points with a bunch of wins over teams like Guerrilla, Voodoo, and Streetgang. All that said, they did pass the eye test at Regionals. The offense looked confident yet patient, and the crop of young players the team has been developing for years has started to hit their stride. So while Furious may not have the traditional resume of a top five seed, if they are knocking on the door of semifinals, it won’t matter. How much stock do you want to put in a meme? That’s essentially the strongest case Machine have to be real title contender this year, the oft repeated notion that Kurt Gibson wins titles in even years. And to be fair, he does! 2012 with Doublewide, 2014 with Johnny Bravo, and 2016 with Ironside. Also to be fair, each of those was a top five team heading into Nationals, and at no point this season have Machine looked to be on that level. Some of that comes down to player availability, as Machine has not always been dealing from a full deck this season. Notably, at Pro Champs, they were missing both Gibson and Pawel Janas, who are both critical to the team’s success. With a full roster at Regionals, the team went undefeated and knocked off High Five in the championship game to reclaim their regional crown. With a full roster for Nationals, Machine should be at their most potent at the right time. But what does that potency look like? What does it look like for this team to fulfill its potential? Despite the presence of Gibson, it still seems like a stretch to project them as championship contenders or even semifinalists. The offense doesn’t seem dynamic enough. The defense is stacked with athletes but has some trouble off the turn and against patient opponents. These may seem like quibbles, but Machine occupies the uncanny valley of title contenders — not the genuine article but close enough that their flaws and deficiencies become more apparent. The seeding was a bit kind, more so than it usually is for a 9th seed, as they get an unproven Furious George in as the 5th seed and Ring team that has faltered in big moments so far this season atop the pool. It may not seem like much to go on, but hey, it’s Kurt in an even year. Another legacy program returning to the spotlight, Chain Lightning ended a three year Nationals drought by scraping together enough points during the regular season to win the Southeast a second bid and then taking care of business at Regionals. Chain are one of only four active teams that have won a men’s division title in the past ten years, and it’s good to see them back at Nationals where they belong. Accomplishing more than just making an appearance could be tough. Chain find themselves in the always unenviable position of being at the bottom of Pool D, with three top ten teams above them. Just taking a game in pool play or even qualifying for the bracket would be a big achievement for the Atlanta squad and a sign that the team is back on the road to their past glory. Chain Lightning’s offensive attack is predicated on the speed of their small cutters and the length of their physical handlers. Inverting the usual “big guys cut, small guys throw” routine has given Chain some pop on offense, with opposing teams unsure of how to distribute their defenders against shifty pull plays. While the speed downfield can create some headaches, most of the Atlanta handlers lack the ability to push into the cutting space and take advantage of mismatches, which limits the offensive ceiling. With such a young core, it likely won’t be another three years before Chain makes it back to Nationals, but it’s tough to see them making a big splash in this trip. Comments on "Club Championships 2018: Pool D Preview (Men’s)"